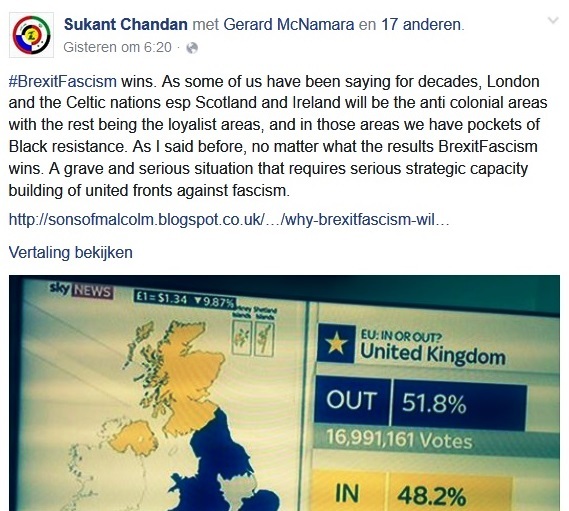 Some thoughts on #Brexit – Ila el amam! Two people that I think very highly of, and two of the loudest voices of truth on Libya back in 2011, turned out to be each other’s opponents when it comes to Brexit. And I can’t even fully take sides, because things are more layered than black or white, yes or no, pro or con. But here are my two cents anyway. Sometimes something potentially right happens for the wrong reasons, and I believe Brexit is one of those things. Quitting an institution whose Council did not hesitate to adopt the implementation of the illegal UNSC Resolution 1973, just to name one thing, most likely is a good thing to do. The problem however is that the majority of the pro-Brexit voters did not vote as they did because they woke up to the criminal nature and activities of the European Union. Many of them want out just because of the refugee crisis. They see their country change as a result of this crisis, and they don’t like that change. And the far-right does like that they don’t like that change, and sees their chance big time. Which, by the way, leads me to believe that Mrs McKinney (first picture above) would not have the greatest time of her life if she were to live in post-Brexit Brittain. In this case, it is even impossible to state that the end justifies the means when people are blind to the origin of what they consider to be evil. 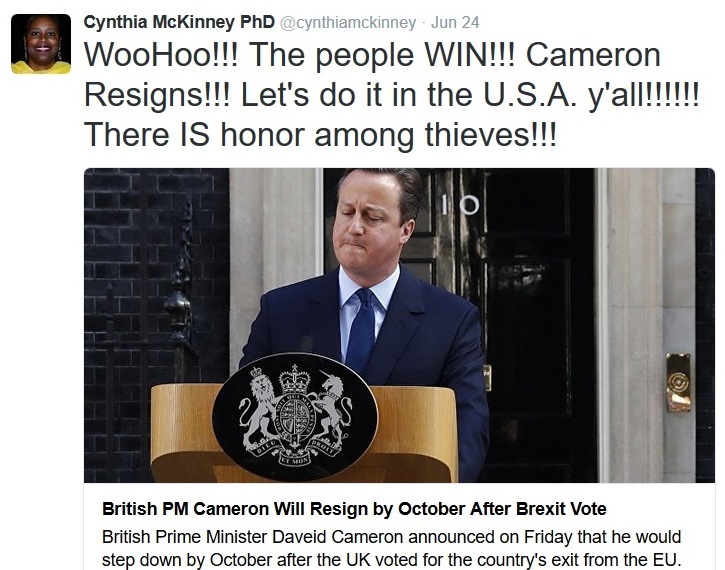 I for one would have rather seen the British people turn against their government directly, saying straight into Camerons face that HE is responsible for the refugee crisis, that HE is responsible for the destruction of Libya and Syria, for hundreds of thousands of deaths in sovereign countries, and that it is because of HIM that the UK, among other EU countries, is flooded with refugees who prior to the Libyan crisis found a save haven in Gaddafi’s flourishing country. But instead it seems to me that the far-right emotionally bribed the British people into voting for a Brexit, because many British feel uncomfortable with the refugee crisis. Perhaps for a lot of right reasons. But they largely fail to go back to where it all began. And that is in Libya, and in Syria as well. So yes, Cameron did resign, after all. But I see no reason to celebrate his resignation. I will start celebrating as soon as he is held to account for his war crimes commited in Libya. I will celebrate when he will be behind bars for the rest of his life. And those who claim that the people of Britain have spoken – I think they are a bit naive. Because a big part of their recent history is hidden for them. Because they still believe their government had to ‘help’ the Libyan people to get rid of the ‘evil dictator Gaddafi’, and for that reason they do not recognize the true evil of the European Union. There is some truth in Edward Snowdens words: “Brexit polls demonstrate how quickly half of any population can be convinced to vote against itself. Quite a lesson.” Then again, it was far less than half of the population that demonstrated against Gaddafi, only some 2-3% did. Yet this was considered to be a full-blown popular uprising, legal enough to justify regime change through a full out, utterly destructive war. Back in 2011, a small group of ‘Libyan rebels’ were convicted to revolt against the Jamahiriya, and indeed, to use Snowdens words, against themselves, by lofty and naive notions of ‘freedom’, ‘democracy’ and ‘human rights’. In the past months a not so small group of British people were convicted to vote for a Brexit mainly by fear mongering far right-wing elements. In the end, people’s behaviour as a result of that is based on the same kind of brainwashing. And I don’t think that’s something to support.